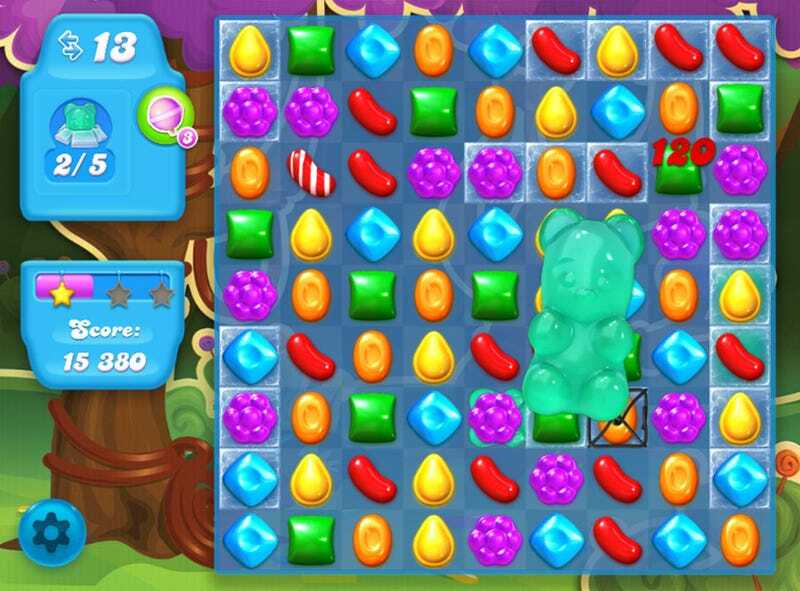 After two and a half years of candy crushing, fans of King's massive gem-matching hit could use a little break. Enter Candy Crush Soda Saga, released today on Facebook and coming soon to mobile. Here's how my time with Candy Crush Saga normally goes. I'll start up the application on my iPad, and try my hand at whichever numbered puzzle caused me to stop playing last time. Should I fail, I put the game back down for another couple of weeks or months. If I succeed I will play intently until I reach another stumbling block. Then I'll move on to some other time-passing puzzler game. It might be another one of King's Saga games, but more often than not it's some other company's clever clone. Unfortunately for King, while the other games in the Saga series have done well, none have come close to the success of Candy Crush Saga. Perhaps that's because the magic is in the Candy Crush part of the game, and not so much the Saga. So now there is a sequel of sorts to Candy Crush Saga, Candy Crush Soda Saga, though it's not so much a sequel as it is an alternative. If a player is stuck in the original game, they can swap over to the new one for awhile. It's essentially the same tactic that's made Rovio's Angry Birds so popular — multiple games sharing a common mechanic that are different enough to refresh players without taking them completely out of the experience. "We don't consider it a sequel. It's just an additional title for the people who love Candy Crush," King chief creative officer Sebastian Knutsson told me in an interview prior to the new game's launch. There are two separate teams working on the two games, and the original will continue to be updated regular alongside this newcomer. Candy Crush Soda Saga shakes up the established formula, but not so much that it explodes in players' faces when opened. There are new power-ups, different ways to combine candy pieces (I'm still getting used to being able to make a square). Some levels slowly fill with carbonated beverage as they progress, changing the direction pieces settle when matches are made — sometimes up to down, sometimes down to up, and sometimes side-to-side. There are candy necklaces to rise above, gummi bears to uncover and much more. I've barely made a dent in the 180 or so levels available at launch. It's quite different, yet still the same. We're in that same colorful cartoon candy kingdom we've always been in, only with a new heroine and a fresh set of challenges. If you hate the original Candy Crush Saga and everything it represents, you aren't going to be swayed by gummi bears, soda pop and frosting. If you loved the first game, Candy Crush Soda Saga will wash that stale sugar taste right out of your mouth.